As the first wave of Apple Watch deliveries hits doorsteps around the world, some consumers have begun to put Apple's durability claims to the test— including the Watch's IPX7 water resistance rating —and found the devices more resilient than previously believed. 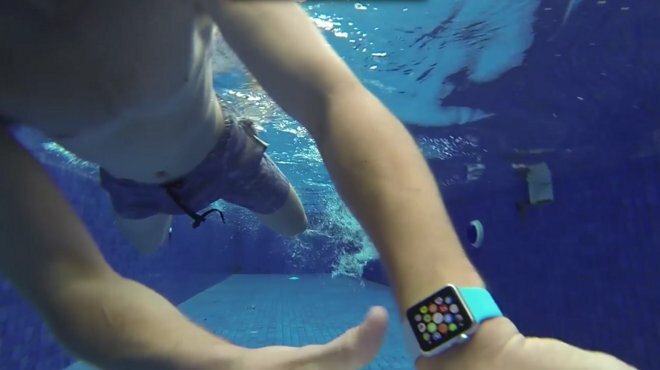 An Apple Watch Sport survived a light spritzing, a heavy dousing, a shower, and ultimately a 15-minute swim in a lap pool, according to a video from Australian website FoneFox. The group even left it to sit at the bottom of their 1.5-meter deep pool for 5 minutes with no ill effects. "So, in total, we had it underwater for about 15 minutes and we just absolutely couldn't get it to stop working," the video says. "It's actually a lot more waterproof than we had originally anticipated." Apple gave the Watch an IPX7 water resistance rating, which generally means the device could withstand immersion in water up to 1 meter for up to 30 minutes. Apple cautions users against such immersion, however. Watch marketing materials say that users "can, for example, wear and use Apple Watch during exercise, in the rain, and while washing [their] hands, but submerging Apple Watch is not recommended." Only the aluminum model has undergone testing thus far, though both the stainless steel and gold versions also carry IPX7 ratings.